If one were to do a search using only the word "soul," there is a strong possibility that the searcher in question might encounter instructions to "see Aretha Franklin." Her ethereal essence, in equal measures cultural and spiritual, only begins to define the everlasting contributions of this nation's dearly departed music royalty, otherwise known as the Queen. Make no mistake about it. There is only one Queen! I'm not referring just to the designation "the Queen of Soul" here. Aretha was far too expansive in her work to ever be limited by the sort of generic labels that record companies once dreamed up as a way to peddle merchandise. No, Aretha was the Queen — period, point blank, end of sentence. Aretha Franklin sang the national anthem at prominent sporting events, and she sang at the funerals of noted dignitaries. She sang for church congregations and presidential inaugurations; her eye-catching "church hat" will forever loom as the defining symbol of Barack Obama's historic moment in January 2009. Underrated as both a songwriter and piano player, she nonetheless held court among a legendary audience of West Coast hippies and once even navigated the Freeway of Love in, what else, a pink Cadillac. At the 1998 Grammy Awards, Ree, with only a half hour to prepare, stepped in for an ill Luciano Pavarotti, singing the aria "Nessun Dorma" as though she had been singing opera all her life. Perhaps there is no better way to describe her prodigious talents than by invoking the words of her adoring father, the Rev. C.L. Franklin, who famously declares in the liner notes of the Amazing Grace album that Aretha is "just a stone singer!" Though she was never signed to the Motown label, as many incorrectly assume, the Detroit native would come to represent the Motor City in so many other ways, with her rise to fame seeming to coincide perfectly with the emergence of the "Chocolate City" era of urban-American political power that begin in the late 1960s. Aretha's breakout year, 1967, just so happened to be the same year that the city of Detroit went up in flames during one of the worst race riots in this nation's history. She was never regarded as a particularly political singer, Aretha nonetheless started her own riot of sorts in 1967, dropping hit after hit on black and pop radio, with songs like "I Never Loved a Man (The Way I Love You)", "Chain of Fools" and "(You Make Me Feel Like) A Natural Woman," among others. By dominating the game on her new label, Atlantic, she erased any lingering memories of her commercial struggles during her early years at Columbia Records. Central to this success was her cover of Otis Redding's "Respect." R-E-S-P-E-C-T came to mean many things to many people, but the respect demanded by Aretha in song ultimately came to crystallize one of the primary links that connected the civil rights movement to the emerging voices of black power. Respect came to suggest a metaphoric political demand, representing the overall consciousness of the times, regardless of one's particular ideology. Aretha had transformed a seemingly banal pop song about romantic misunderstandings into a gendered political statement that fully expressed the African-American zeitgeist through her own force of will, evocative emotional style and transformative vocal abilities. One could easily get lost in all of her many musical accomplishments, honors, awards and record sales, and while all of that is quite relevant, understanding and appreciating Aretha involves much more than reciting such statistics. To understand Aretha is to understand the black experience in America. To appreciate Aretha is to appreciate the contentious merger of the sacred and the secular in American life. Aretha's place on the cultural landscape furthered the advances made by figures like Ray Charles and Sam Cooke as the evolving narrative of the black religious experience came to occupy a prominent place at the center of the American mainstream. Two of her live albums from the early 1970s demonstrate her ability to serve as a bridge over the troubled waters of American racial, political and gender differences that characterized those times. In 1971 she invaded Bill Graham's legendary countercultural hangout, Filmore West. The resulting album, Aretha Franklin Live at Filmore West, complete with a guest appearance by Ray Charles, moves effortlessly between compositions by the Beatles and Simon and Garfunkel to the down-home blues of "Dr. Feelgood." Her duet with Brotha Ray, "Spirit in the Dark," rounds out this amazing documentation of progressive cultural existence set against the corrupt moral darkness of the Nixon era. In 1972, Aretha took her talents back to the place where it all started, the church, when she teamed up with celebrated gospel composer James Cleveland for Amazing Grace, recorded live at the New Temple Missionary Baptist Church in Watts, Calif. Amazing Grace is a religious album that doesn't require you to convert; at the same time, it is a secular album filled with the spirit. It is potentially all things to all people, a musical testament that is at once reflective of that old-time religion while still managing to be timelessly nondenominational. 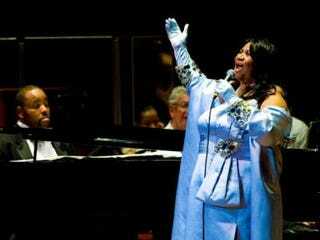 When Aretha reaches Marvin Gaye's "Wholly Holy," it's all over but the shouting! Listening to the album is an experience, a lush aural soundscape imbued with the competing cultural sensitivities that defined the day. Aretha, barefoot and clothed in striking Afrocentric attire on the album's cover, represents the soul of '70s black America here in no uncertain terms. She was blackness personified. By going back to the church, a place that she and her father insisted she had never left, Aretha had fully transcended it, making the sacred-secular connection one that, going forward, would be neither sacred nor secular anymore. One might describe the resulting ethos as simply Aretha. Unlike many of today's artists, Aretha leaves us with a massive body of work covering multiple decades. While much of her best work was recorded in the late '60s and early '70s, her blues and jazz recordings on Columbia before that time, and hits like the Luther Vandross-produced "Jump to It" and "Who's Zoomin' Who?" on the Arista label in the '80s, also deserve a listen. Aretha covered many eras and genres, always staying firmly in her lane while doing so. A personal favorite has always been her work on the sound track for the 1976 film Sparkle, for which she teamed up with fellow traveler Curtis Mayfield, whose production helped to solidify an especially slept-on sound track. A close inspection would reveal that both gospel music and the blues are the original seeds that gave rise to the colossal tree we now call American music. Aretha represents the organic fruit of that tree. Like that group on the Motown label who sang about the deception of smiling faces, Aretha was "the undisputed truth." She was soulful, bluesy and righteous — a national treasure and a cultural behemoth. The name says it all: Aretha. If it were permissible to retire names the way they retire jerseys in sports, then Aretha's is a name that should be retired immediately. Gone but never forgotten. Long live the Queen! Todd Boyd, Ph.D., is the Katherine and Frank Price Endowed Chair for the Study of Race and Popular Culture, and a professor of critical studies, at the USC School of Cinematic Arts. Read more on his blog, Notorious Ph.D.